Republican Jan Angel is holding onto her lead over Democrat Kim Abel in the race for the 26th District, position 1. Last night, the state auditor had Angel at 50.77 percent of the vote to Abel’s 49.23 percent. Today, it’s 51.20 to 48.80 percent. Results in Kitsap are 50.61 percent for Angel, 49.14 for Abel. District-wide, incumbent Larry Seaquist’s lead over Republican challenger Marlyn Jensen has narrowed from 61.02 (compared to Jensen’s 38.98) percent last night, to 59.92 (compared to Jensen’s 40.48) percent today, a moot point given Seaquist’s sizable margin over Jensen. In Kitsap, Seaquist has 60.97 percent of the vote to Jensen’s 38.89. The Kitsap County Auditor’s office will update numbers at 4 p.m. today. 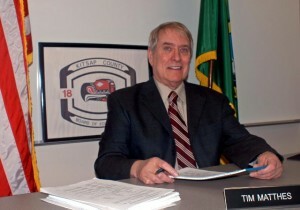 Political reporter Steve Gardner will post a story later today with updates on all Kitsap-related races. I spent Tuesday night in downtown Port Orchard shuffling between Amy’s on the Bay and MoonDogs Too. At the former, 26th Legislative District candidate Jan Angel celebrated her 62nd birthday and a slim lead over her Democratic opponent, Kim Abel. Abel, meanwhile, was partying at MoonDogs with supporters and State Rep. Larry Seaquist, D-Gig Harbor, who would end the evening with a comfortable lead in the race to retain his seat. I did not plan it this way, scout’s honor, but I happened to be in the Democratic camp when presidential candidate Barack Obama shattered the 270 electoral vote barrier to become this nation’s first African-American president elect. 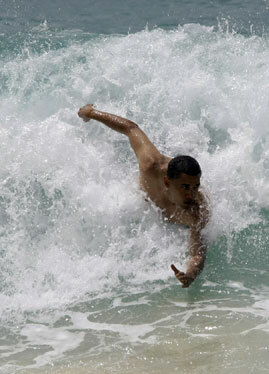 The time was 8:01 p.m.; Obama had 284 electoral votes. Within 15 minutes, by my estimation, the stations were broadcasting news that Republican contender John McCain had graciously conceded the fight. When news of Obama’s victory broke, cheers and whoops erupted from the crowd in the upstairs room at MoonDogs. Say what you will about Obama, the fact that Americans elected, by an overwhelming margin, an African American president is an historic event. The fact wasn’t lost on people like me, 53, who are old enough to remember an all-too-recent time when race was either a stumbling block or a privilege. Beyond that, Obama’s supporters seem to respond to his charisma (whether that’s enough to run a country in dire economic straits is yet to be seen). I looked around at the crowd and saw 67-year-old Kay Travatte, watching the screen, hands to her face, tears streaming down her cheeks. “This means a lot to you?” I asked. “It’s been a long time,” she said referring to both Obama’s campaign and the last time she was so moved by a political leader. Travatte, a Gig Harbor resident, was too young to vote for John F. Kennedy, but she worked on his campaign. She held a job with the F.B.I. the year he was assassinated and it took the wind out of her political sails … until now. “From the first time I saw him talk, he made me want to come forward and do something for this country,” said Travatte of President-elect Obama. Another woman, old enough to speak with authority, Marcia Loraditch, 62, of Port Orchard, summed it up this way, “We just stepped into history,” she said. Last minute campaigners for both the Republican and Democratic parties set up camp yesterday evening on opposite street corners at the intersection of Bethel and Lund avenues in South Kitsap. 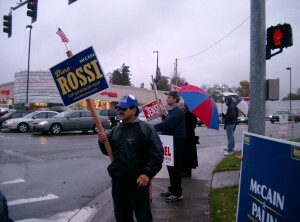 Mike Acosta was among a group of more than a dozen people who braved the rain Monday to wave signs for local and national Republican candidates. Behind him, left to right are Adam Isackson, Marlyn Jensen, candidate for the 26th Legislative District, position 2, and Eric Stancin. 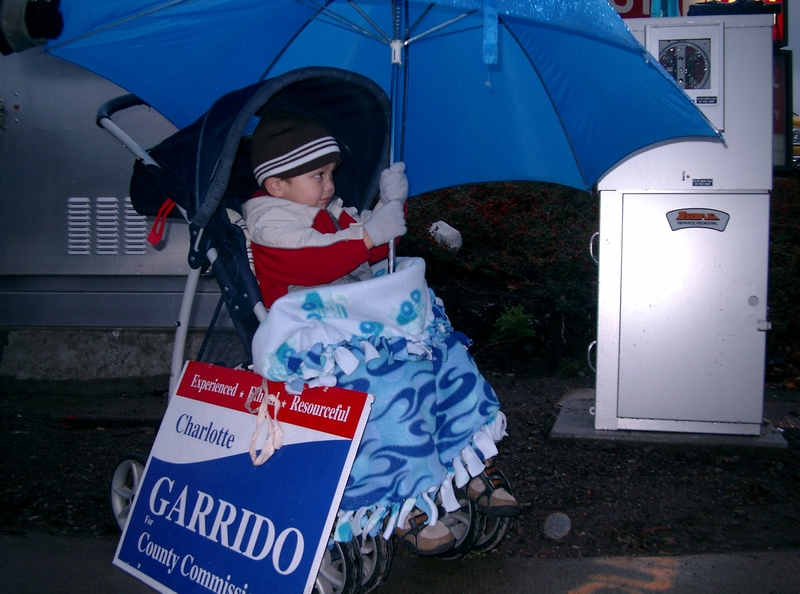 Gabriel Fernandez, 3, stayed dry while his mother, Rhiannon Fernandez, and others waved signs for local and national Democratic candidates. Lack of time — and not the desire to distance his candidacy from the Kitsap Alliance of Property Owners’ strong stand on property rights — was the driving reason for Tim Matthes’ recent resignation as vice president of KAPO. But the need to appeal to a broader base did play a small role in his decision, Matthes said today. A Republican, Matthes is running against Democrat Charlotte Garrido in the race for South Kitsap Commissioner. The two survived the top two primary Aug. 19. Democrat Monty Mahan failed to make the cut. Matthes said his run for commissioner is demanding more time than he had expected. Last week, he missed the Kingston Chamber of Commerce forum at which Garrido was present. The other event, nearly missed, was a KAPO meeting, Matthes said. Besides stepping down from his post with KAPO, Matthes has arranged to have his seat on the Kitsap County Board of Equalization covered for the next two months. The volunteer board hears challenges to property tax valuations. KAPO is known for its advocacy of individual property rights and interest in local land-use issues. Matthes remains a member and said, “I still feel strongly about property rights.” But he added that, as a candidate, he has been trying to connect with voters of all persuasions. Vivian Henderson, executive director of KAPO, supports Matthes’ decision. Matthes’ post with KAPO will be filled by Jackie Rossworn, who was voted on by its board of directors. She will serve through February, the end of Matthes’ term, when KAPO will elect new officers. A Port Orchard Campaign Kickoff will be hosted by Citizens to Elect Charlotte Garrido on Saturday, May 17th, from 5:00 to 7:00 p.m. at the Bay Leaf Bistro, 834 Bay St. Port Orchard. Charlotte Garrido will meet and greet attendees. Food and beverages will be served. Information is available at www.charlottegarrido.com. Contact Ray Garrido at info@charlottegarrido.com or 360 447-7386.